Samsung Galaxy Tab S4 started taking pre-orders today, and it will be released next week, with both Samsung and Best Buy as well as Amazon being the first stores we can buy it from, with the official Samsung Galaxy Tab S4 release date being August 12 – 24, depending on the regional market. 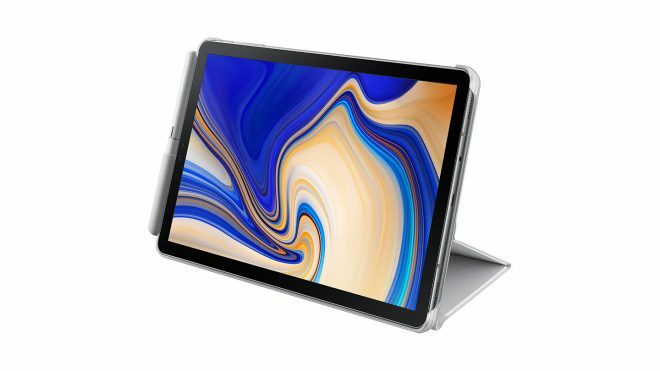 It was possible to reserve it after the Samsung Galaxy Tab S4 announcement last week, but it didn’t start to take orders before today. The Samsung Galaxy Tab S4 price is $649 for the 64GB version and $749 for the 256GB version in either black or light grey/white, with the new S Pen included in the package. The 4GLTE version is $729 with 64GB storage. There are 3 optional and official accessories made new for the Samsung Galaxy Tab S4 10.5. 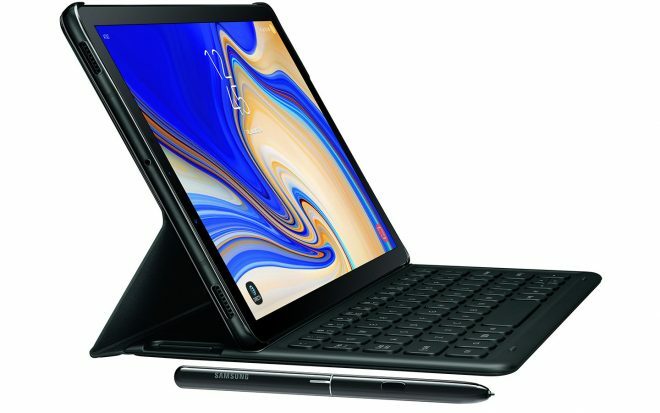 The first of these are the new keyboard and cover Samsung Galaxy Tab S4 Book Cover Keyboard, which acts both as a keyboard, a tablet stand, and as a tablet case and cover when closed. 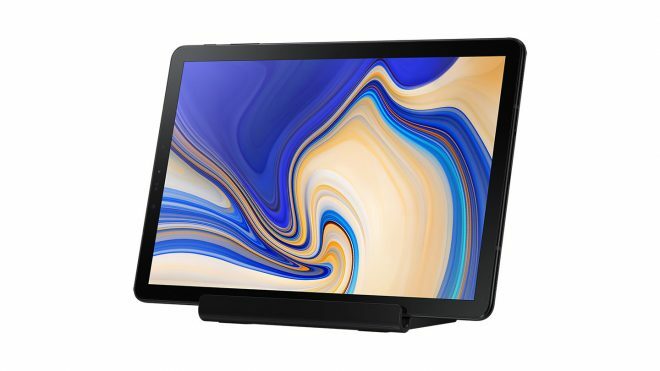 There’s also a keyboard-less cover Samsung Galaxy Tab S4 Book Cover in either black, which also works as a tablet stand at two different angles, and it has a side flip for housing the S Pen. 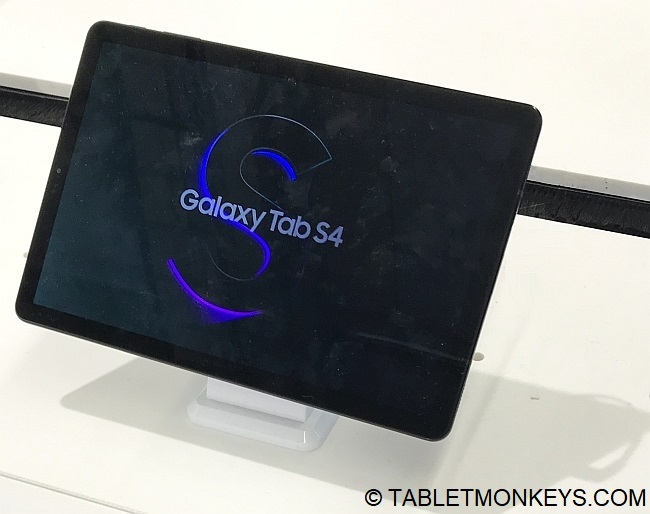 And finally, there’s the totally new Samsung Galaxy Tab S4 Charging Dock Pogo, which is a solid tablet stand that tilts the tablet back a little when it’s standing and charging on a table, while also displaying the Daily Board mode with daily updated information on things that matter to the user. The name may not roll off the tongue intuitively at first, but Samsung called it that because it is a charging dock, and also because it connects with the POGO pins, so there’s no need for cables into the tablet when charging it in that mode. It is also possible to buy additional pens in black or white, should the pen get lost or if you want another color for it. The Samsung Galaxy Tab S4 launch is timed perfectly, since there are not other Android tablet on the horizon either announced or leaked that will be able to match this tablet in 2018. So in terms of specs, features, apps, and services, this is the best overall Android tablet for quite some time to come. So this one’s for the 2018 Xmas wish list for sure.